Assoc. Vice President, Global Head -Diversity and Inclusion, Sustainability Governance & Reporting, Infosys Ltd.
Aruna started her career as a Cost Accountant and has also worked extensively in the area of sales and marketing, quality processes and systems, Leadership development and Diversity Consulting. Over the last 27 years, she has traversed many fields gaining a rich experience and perspective across organizations, people and functions. She currently heads the Diversity & Inclusion portfolio at Infosys and under her leadership Infosys’s D&I efforts have received a huge fillip. She participated actively to introduce the Maternity Amendment Act to facilitate women’s return to work post maternity. 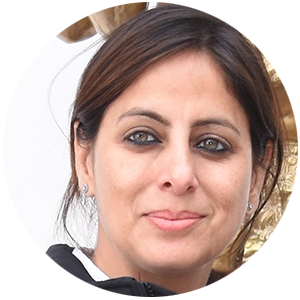 She is working with NASSCOM on the WomenWizardsRuleTechnology one of the largest capability building initiatives in the country for Women in Tech, at the industry level. She leads Infosys’ Sustainability Governance and Reporting efforts. Under her leadership Infosys was one of the first companies to publish a Business Responsibility Report in India, the first GRI (G4) comprehensive report for the IT industry and was responsible for responsible for Infosys’ inclusion in the DJSI Emerging market and World Index. A leader in the Executive Council at Infosys Bangalore Development Centre, she is also Founder Mentor of Green Connect, the Infosys environmental sustainability initiative powered by Infoscions. Leading the Elevated Road project on Hosur Road got her elected to the executive committee of the Electronics City Industries Association (ELCIA). In her tenure as President of ELCIA (2013-2015), India’s richest industrial estate with over 180 member companies, she set up Asia’s largest IoT hub in partnership with CISCO to nurture the spirit of entrepreneurship in electronics manufacturing. She also created a common facility for MSME’s, the first of its kind in Karnataka for electronics manufacturing. She also served as the Chairperson of ELCIA Trust (2015 -2017). Under her leadership the Trust adopted 19 government schools (with over 4800 children) in the vicinity of Electronics City under the Model School initiative. As part of this project she set up the first Science Lab for these children to nurture ‘curiosity’ in mathematics and science through experiments and play. She works with Bangalore City Police and the Government of Karnataka on projects concerning improvements to traffic and infrastructure and the prevention of crime in the city. In 2009, she was honored with the WILL Women’s Choice Award, a special recognition for Women in Leadership. She was also selected as The Most Happening Woman in Bangalore – 2011, by the Women’s Guild, a forum for talented women across fields and endeavors. A keen sports enthusiast, Aruna has represented Karnataka in Women’s Hockey for many years including captaining the state team, school, college and university teams in a sports career spanning over 11 years. She is also an amateur athlete (marathon), motorcyclist and rallyist. She serves on the Board of Studies at Mount Carmel College’s Commerce Department and is the President of the Citizens for Civic Action Residents Welfare Association where she is experimenting with larger citizen-led social change through building sustainable communities.